There comes a time in many musicians' lives when they have an opportunity to succumb to the allure of radio success and the money that comes along with that. 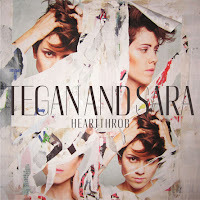 That's apparently what Tegan & Sara were faced with when recording their seventh album Heartthrob. The Calgary twins jumped gleefully at the opportunity and produced a record that seems to exist only to garner commercial radio airplay. It's clear from the beginning, with lead track and first single "Closer", that the duo have embraced electro-pop wholeheartedly. That track is stadium-friendly rave music of a second rate. Beyond that the twins run through a number of dance pop genres in an attempt to find an elusive winning formula. That sees them swings from horrific light R&B on "I Was a Fool" to sickeningly sunny synth pop on "Drove Me Wild". They even have the gall to affect a slight Jamaican accent on the pop-Reggae-influenced "How Come You Don't Want Me". The production even manages to run the Quin's harmonies. Usually a strength of their music, it seems so processed that it lacks any of it's customary bite. Tracks like "Goodbye, Goodbye" and "Love To Say" feature lazy melodies and even lazier choruses. Accompanied by such uninteresting arrangements, it focuses more attention on the lyrics, making the listener realize just how one-dimensional Tegan & Sara's lyrics have been all along. An artist evolving is important. However, when the results are a record like Heartthrob, it makes one wish the offending group broke up before they had a chance to tarnish their entire back catalogue. Best Least bad tracks: "I Couldn't Be Your Friend", "Shock To Your System"